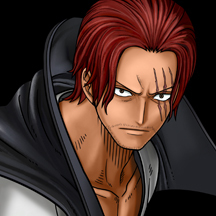 Head of the Red-Hair Pirates. One of the Four Emperors. He was the original owner of Luffy’s straw hat and the reason Luffy wanted to become a pirate. After the Battle of Marineford, he buried Ace and Whitebeard on an island somewhere in the New World.